David Cameron came under attack yesterday over his promise to protect funding for schools after it emerged his plans would see spending per pupil fall in real terms. Speaking at a school in Enfield, North London, yesterday, Mr Cameron made his pledge not to cut the funding per child because good schools ‘need money’. But his pledge that the amount of funding per pupil would be ring-fenced in the next Parliament started to unravel as he admitted spending would not increase in line with inflation. By the end of the next Parliament, this would mean a cut in real terms of around 7 per cent to the schools budget for children aged between five and 16, according to the Institute for Fiscal Studies. Mr Cameron said the Government ‘won’t tolerate failure’ and would raise achievement in 3,500 schools rated ‘requires improvement’ by the watchdog Ofsted. He said every secondary school in this category would be expected to become an academy. Russell Hobby, leader of the National Association of Head Teachers, attacked the proposals as ‘ill informed’ and a decision to ‘declare war on schools’. 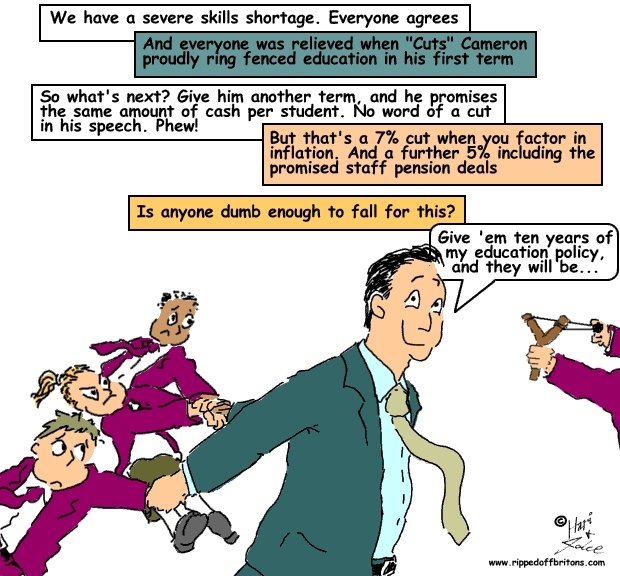 SOURCE GUARDIAN: Reality check - is David Cameron promising schools more cash or less? Luke Sibieta, director of programmes at the Institute for Fiscal Studies, fleshed out that picture with more detail. Because the number of pupils is going up between 2015 and 2019, the budget in cash terms will go up by the same amount, as Cameron promised. But even allowing for the extra cash, Sibieta estimated that the real value of the overall schools budget would be eroded over the next parliament because it would not keep pace with inflation. That would amount to a shortfall of about 7% in real terms. On top of that, there are new pressures on school budgets that will reduce the money available in real terms further. Employer pension contributions have been increased for schools by 2% to ensure the schemes are better funded – that money will have to come from the schools budget. As will an extra 3% for employer national insurance contributions, which have changed as a result of the new single-tier pension. Taken together, that amounts to a cut of 12%, when inflation and the consequences of teacher pension and national insurance contributions are factored in.